World attention has focused on the newly independent Baltic states of Latvia, Estonia, and Lithuania, as they struggle to become politically and economically viable. In this book, Anatol Lieven presents an intimate and engaging portrait of the history and culture of the Baltic states from their ancient origins to their contemporary status. He explores the culture and personality of the Baltic peoples, their religious and racial differences, their relations with Russia and with the West, and their prospects for the future. 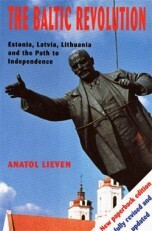 Lieven begins by describing the ancient Baltic peoples, their conquest by the Christians, the evolution of the Lithuanian empire and their union with Poland, and the experience of the Baltic provinces under the Russian Empire. He then looks at the countries’ first struggle for independence in 1918, the failure of democracy and the establishment of authoritarian regimes, and the Soviet annexation of the Baltic in 1940. Lieven discusses the class structure of the Baltics and the ethnic tensions that have existed between the Germans, Jews, Poles, and Russians who live there. Drawing on a wide range of sources including interviews, newspaper accounts, and his own observations, he describes and analyzes the rise of national movements in each of the three countries after Glastnost. He concludes by discussing the new constitutions and the elections of 1992, the current forces of order, the demolition of the Soviety economies, and the possibilities for democracy and Europeanization or for ethnic conflict and nationalist dictatorship.